A few months ago when I asked Angela Priestley, to talk about her leap to buy online news hub Women’s Agenda, it was not against the sexual misconduct media storm that has since broken both in the US and Australia. If there was ever a doubt as to just how important women created and owned media is, we have reached the point of undeniability. Not only for the content it chooses to publish, but also the for the way in which it’s created. When Women’s Agenda was launched in 2012 it’s mission was to report on politics, business, leadership, tech and life from the perspective of professional women and female entrepreneurs. At that time Angela was the founding editor. 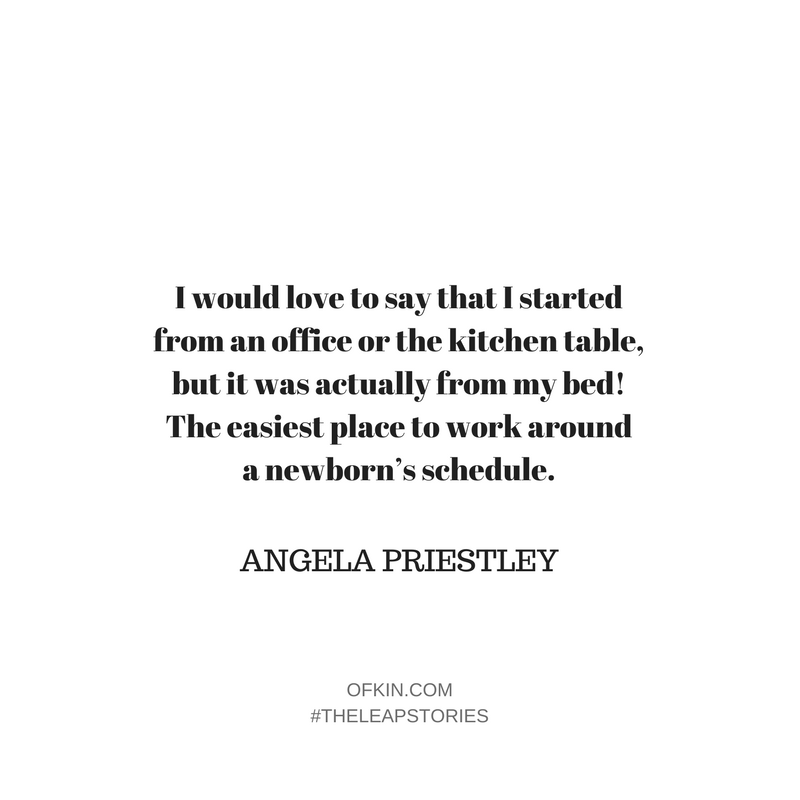 Four years later, when the opportunity arose for a management buyout, Angela took the leap to buy it, giving her greater control and voice in reporting the issues that affect how women live and work. Today she is more than ever, fiercely committed to helping more women to get heard on issues that matter. If we are to make any progress toward closing the $26K gender pay gap, bumping female participation on boards above a stagnant 25%, getting women in manager roles to lift higher than 38%, having equal representation in government and ending discrimination and violence against women, we need people with loud microphones and commitment to gender equality and social justice to take down the current patriarchal structures holding half the population back. We need more courageous journalists, fearless editors and ethical media owners to tell the stories that change the status quo. Furthermore, as a country with one of the most highly concentrated media ownership structures in the world, we need to support independent Australian media, like Women’s Agenda (subscribe to their email newsletter here!) more than ever. One of my core beliefs is things only get better when they’re talked about. We need to talk more about things that matter to create a more equitable and safe place for women everywhere. It’s time to break silences, speak up above the interruptions, above the mansplaining, above the intimidation, and to publish, promote and push a new agenda. 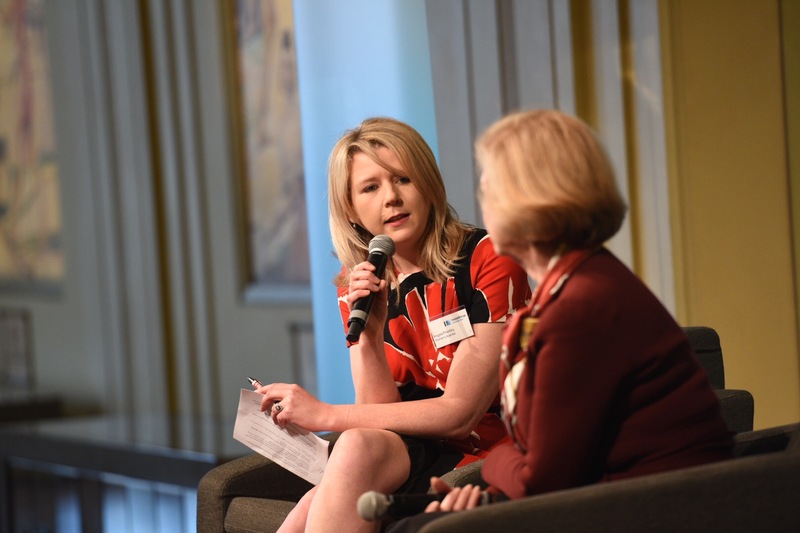 Two amazing women – Angela Priestley, Founder of Women’s Agenda, interviewing Gillian Triggs. A journalist. I read newspapers and news magazines from a young age and I wanted to be a part of telling stories that would keep people informed, and force them to pay attention. I studied journalism and later a Master of International Relations. My current ‘study’ involves trying to keep up with the latest trends, data and news regarding some of the core issues I’m deeply passionate about: diversity, equality, climate change and good/decent leadership. I’m also obsessed with researching how publications are funding journalism around the world. Career-wise, the scariest leap I made was acquiring the news publication Women’s Agenda while I was at home with a newborn and a toddler in 2016. I had launched Women’s Agenda as an Editor with Private Media back in 2012 and helped build it into an influential media and events business. When I heard a management buyout was an option, I jumped at it. The contract of sale required that I start publishing and fulfil existing commercial obligations within three weeks, including running our national awards program for emerging female leaders. It also required me to cut as many costs as possible in order to re-shape the business and start determining some kind of strategy to take it forward and create sustainable revenue streams. I would love to say that I started from an office or the kitchen table, but it was actually from my bed! The easiest place to work around a newborn’s schedule. My husband, who has always run his own business and demonstrated the power (and pain) of building your own mini-empire. A beautiful good friend from my university days, whose time was cut short but was the most selfless, passionate and optimistic person you could ever be lucky enough to meet. My siblings and parents. We’re all strong-willed and share very different opinions, yet somehow manage to get along! A laptop, an iPhone, and a bunch of excellent supporters. I never experienced that. It was an opportunity, more of an ‘I cannot let this one pass’. In saying that, I’ve experienced plenty of ‘I can’t do this anymore’ with this current business. It’s a daily occurrence. This was an opportunity that came up and I didn’t have a huge amount of time to consider it. A blessing, perhaps. In saying that, making the move to running a media business is seriously challenging, especially with a newborn, and especially at a time when so many media businesses are still determining how to become and remain profitable – and often need to rely on events to make it happen. I first needed to make sure I had supporters on board (which I did). I tapped mentors and contacts for help and found I rarely hit a ‘no’. Hard work! It’s taken me a while to get comfortable taking financial risks – in the early months, I’d actually pay some of our costs by taking on external freelance writing work. That wasn’t sustainable and was a distraction. We now work with a number of clients and partners and I’m more comfortable with costs now, although remain cautious. We don’t have external investors and I needed to get to the point of earning a salary as quickly as possible. I got there within six months, and was able to grow our team from there. I regret not making more leaps, particularly in my twenties when I had less responsibilities. My biggest fears generally do not involve my business failing – a failed business is pretty minor in the grander scheme of things, there are much more important things to worry about. There are always financial fears, especially in publishing and especially when taking risks on stories we believe are important. We mitigate the risks as best we can, and I personally also know I can always go and get a job! 7. Most days it’s great. But I generally feel exhausted – as does anyone with little kids. 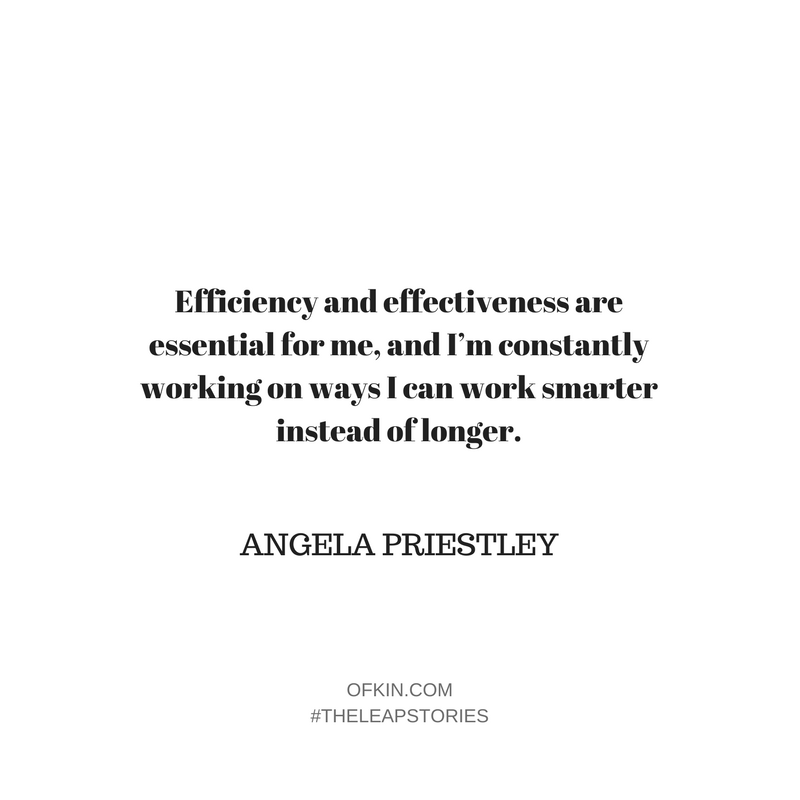 Efficiency and effectiveness are essential for me, and I’m constantly working on ways I can work smarter instead of longer. That means doing everything from avoiding face-to-face meetings (this has been liberating), to setting specific time-limits on how long I spend on projects. Independence, being my own boss, and being in full control of my contribution. There are no approval processes regarding new initiatives or programs we want to experiment with. No check-offs regarding new stories we want to push, risks we’re looking to make, or new hires we bring on. We can innovate and constantly move forward. There’s also the absolute flexibility of working how and when I want (and offering this to staff) – taking a swim or yoga class in the middle of the day, spending the afternoons with the kids. Independence and being your own boss! There’s no one else to blame when things go wrong. Mistakes affect the bottom line which can then ultimately affect home and how much money go into employing staff – and then my own family. Publishing is also risky, and it can feel very lonely being the last one to make the call. Next leap is to push harder for Women’s Agenda to advocate for women’s opportunities and hold businesses and governments to account when it comes to matters of diversity, equality, climate change, CSR, and leadership. We’re launching a new platform in the coming months that I’m confident will push employers to lift their standards regarding all of the above – to make little shifts that can dramatically improve people’s lives. Commit to the wave. This is something I heard from a surf coach, that’s relevant to work you’re passionate about. Often we can work hard and get the momentum we need, only to hesitate when we see the big drop and consider the speed at which we’ll then move. Work hard, but commit to riding the energy and momentum such hard work will bring. Strong female journalists, especially those who’re asking the difficult questions and are constantly challenging traditional power structures on television, radio, in print, online and across social media. I also admire strong media entrepreneurs who are putting so much on the line to keep power in check – the US particularly has some excellent individuals who’ve leapt from publications like the New York Times and the Washington Post to launch savvy, independent publications breaking significant stories. A strong and diverse media has never been as important as it is now. Voice what you’re looking to do and ask for help. Hearing: Podcasts, including Slate’s Political Gabfest (great for following US politics) Recode Decode (excellent for latest in tech) & Chat 10, Looks 3 (Leigh Sales & Annabel Crabb being the best friends you want). On Spotify, I’m making my way through an excellent ‘Women of Indie’ music list. Eating: Dark, vegan chocolate. And lots of it. Drinking: Too much coffee in the mornings, a moderate amount of red wine in the evenings. Reading: Tony Jones’ The Twentieth Man & Brigid Delaney’s Wellmania. Loving: My two boys and husband. Women’s voices, stories and opinions matter. This week, I hope you have the courage to write a story for your life that sees you leaping to speaking up and being heard in whatever arena you find yourself. It’s the only way change happens.